When I first read the plot of this book I could not believe how perfect it was! All I could think was how I never thought about it myself considering it has the characters from my 2 favourite Jane Austen books: Pride & Prejudice and Persuasion. Getting them together the way Joana Starnes did makes perfect sense! The idea could not be better! After Elizabeth’s refusal in Hunsford, Darcy meets Miss Anne Elliot and believes she would be the perfect wife for a marriage based on contentment. She is amiable, kind, intelligent and her family is perfect for Darcy’s family standards. On the other hand, Captain Wentworth meets Elizabeth Bennet and also believes she could be a perfect wife if he can not have Anne’s love. At a certain point in the book the four of them meet and they are forced to face their true feelings. Even though Anne appears to be (in the eyes of society) perfect for Darcy, she is obviously not his perfect match. She is not his other half, and the same applies for Captain Wentworth and Lizzy. The book is extremely well written, and it’s truly passionate, with deep feelings and no excessive dramas or incredibly bad villains. It’s a believable story, perfectly situated in the era. There is no lack of propriety, and that does not prevent us from reading a truly romantic story. We read the book from Darcy’s perspective and for me, one of the best things about the book is that Darcy is not seen as the only one at fault. The author really understands and develops both characters just like Jane Austen created them and not as a version of Darcy and Lizzy as many authors do. Unlike many books, Darcy is not seen as someone full of faults who changes completely just to please Elizabeth. In this book Elizabeth understands she was also prejudiced and realizes that even though Darcy was not at his best while proposing to her, he had his reasons to do it as he did. She understand his background and how that influenced his behaviour. I do not believe I have ever read a book more true to the real Darcy and Elizabeth as The Subsequent Proposal. I really enjoyed reading this book and did so in one day. I was only sad that the book was so short. I believe the author could have developed the story a little bit more. The idea was really good and deserved more scenes, more dialogue, and maybe even more Wentworth and Anne, but I do recommend it! Thanks for the wonderful, wonderful review, Rita, it really made my day! 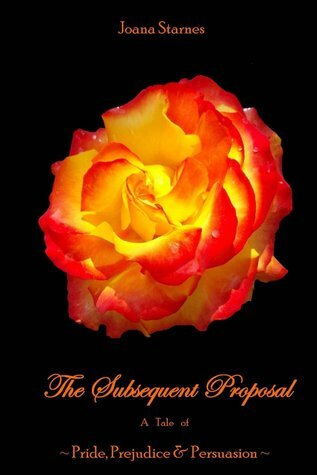 I’m so thrilled you enjoyed ‘The Subsequent Proposal’ so much, it’s such a joy to hear it! Love this review. Extremely well written! !